Femoral Canal is a short fascial tube (medial compartment of femoral sheath) which declines quickly in width from above downward and is closed inferiorly by the fusion of its walls. The upper end of the femoral canal, which opens into the abdominal cavity is referred to as femoral ring. An oily areolar tissue referred to as femoral septum normally shuts it. Cloquet’s node is a lymph node situated in the femoral canal. The canal gives a dead space for the growth of femoral vein during increased venous return. Below the inguinal ligament, the canal is located posterior to the saphenous opening and thin cribriform fascia, and anterior to the fascia covering the pectineus muscle. The protrusion of abdominal contents (a loop of intestine) via the femoral canal is termed femoral hernia. The femoral hernia gifts as a globular swelling in groin inferolateral to the pubic tubercle below the inguinal ligament. The femoral ring is the site of potential weakness of the groin when the femoral ring is enlarged as a result of abdominal distention with weakness of abdominal muscles, example, pregnancy. Any state, which increases the intra-abdominal pressure, example, continued strong coughing or straining powers the loop of intestine into the femoral ring, it takes with it the peritoneal covering of the abdominal opening of the canal in front of it. This creates the hernial sac, which descends in the femoral canal posterior to the poor cribriform fascia and bulges forwards via it into the superficial fascia of the thigh near the saphenous vein. 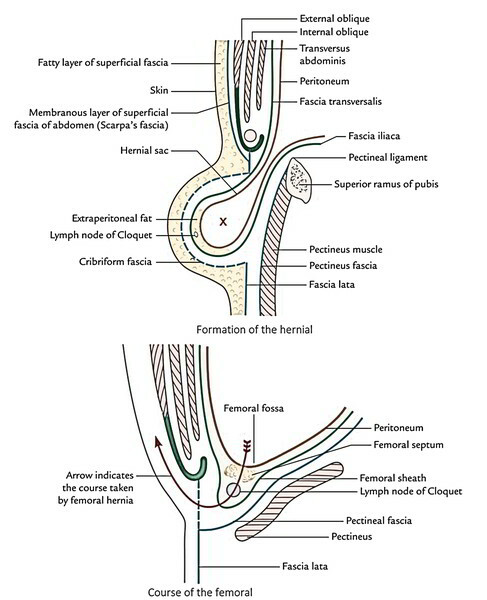 If hernial sac proceeds to enlarge, it enlarges superolaterally in the superficial fascia. As a result, the whole hernia becomes U-shaped. The femoral hernia is much more common in female since the femoral ring is bigger because of greater width of the pelvis.